2010 is drawing to a close. I realize the year isn't over yet, but I wanted to take the time to fill out this survey started by Jamie over at Perpetual Page Turner, because I think it's an awesome way to look at a year of books in retrospect. Way to start with the hardest question! :P I re-read Pride and Prejudice at the beginning of the year, and that is always a favorite of mine. Otherwise, I absolutely loved Before I Fall by Lauren Oliver, The Hunger Games Trilogy by Suzanne Collins, Shiver by Maggie Stiefvater, Northanger Abbey by Jane Austen and North and South by Elizabeth Gaskell. Actually, my book for this question is an ARC that's not coming out until 2011, and is Entwined by Heather Dixon. It looked great but just fell really flat for me. My review will be up in early April, I believe. Entwined was disappointing, but otherwise I have to say Shadow Hills by Anastasia Hopcus. I think books are like significant others: in order for you to really like them, there has to be chemistry, a certain inexplicable spark. I thought the whole premise of Shadow Hills was interesting, but it just never clicked for me. However, I'd like to see where Hopcus goes with it, so I'd definitely read a sequel. Definitely The Dark Divine by Bree Despain! Not only was this a really original take on werewolves, Grace (the main character) had a fantastic character arc. Shiver by Maggie Stiefvater, closely followed by Before I Fall by Lauren Oliver. The Hunger Games trilogy by Suzanne Collins, but also the Caster Chronicles by Kami Garcia and Margaret Stohl. I have Beautiful Darkness in my TBR pile, and I can't wait to see where they take their exceptionally well-crafted tale next. I also loved Need by Carrie Jones, and can't wait to pick up the other books in that series. Suzanne Collins and Lauren Oliver! Boy Meets Boy by David Levithan. I loved the high school he crated in this book! I also really enjoyed Arcadia by Tom Stoppard, although that's technically a play. Oh, easily The Hunger Games trilogy. I was one of those people who bought and read Mockingjay the day it came out. Honorable mention also goes to The DUFF by Kody Keplinger and Crossing Lines by Paul Volponi. 10. Book you most anticipated in 2010? Mockingjay by Suzanne Collins. The day before it came out I drove to Target for the sole purpose of seeing if they had put it out early (they hadn't). It's a good thing I wasn't at home the day it came out, because I would've been so antsy waiting for the package. Instead I came home at 5, and there it was. 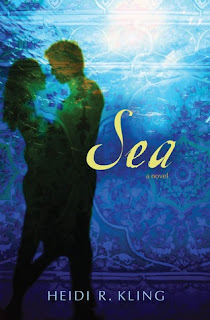 The cover for Sea by Heidi R. Kling, which is completely breathtaking. It also helps that the book is fantastic. 12. Most memorable character in 2010? I'm going to divide my answer to this into two separate categories. In terms of a bookish crush, I loved Sam for Shiver. Poetry loving, guitar playing super cute werewolf? Yes, please! Mr. Thornton of North and South was also great, but let's not forget our Austen men, Henry Tilney and Mr. Darcy. Otherwise, Infinite Darlene from Boy Meets Boy and Astrid from Rampant were both great. Mrs. Bennett also had me cracking up, but hopefully that goes without saying. 13. Most beautifully written book in 2010? This is another answer that I'm splicing into two parts. For adult books, I re-read Mrs. Dalloway by Virginia Woolf earlier this year and I think Woolf's prose is beautiful. I still prefer To the Lighthouse, but I wind up loving everything I read by her. In terms of YA, I have to go for Shiver. Stiefvater's prose was just so poetic to me. Before I Fall gets an honorable mention here as well, as that had some jaw-droppingly gorgeous writing in it. The last honorable mention goes to The Replacement by Brenna Yovanoff--I can't wait to pick up more by her. 14. 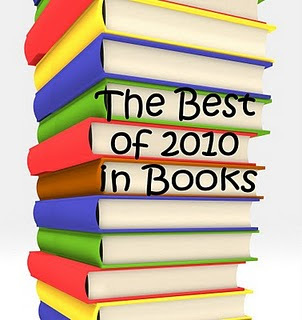 Book that had the greatest impact on you in 2010? It's not technically out until June of 2011, but Crossing Lines by Paul Volponi. I don't want to say anything about it as very few summaries are online, but read this book when it comes out. 15. Book you can't believe you waited UNTIL 2010 to finally read? North and South and Northanger Abbey! I wound up seriously loving both of these. 1. New favorite book blog you discovered in 2010? This is such a tough question! I love Book Rat, Chick Lit Teens, Imagination In Focus, Reading Vacation, WORD for Teens, The Nerd's Wife, The Naughty Book Kitties and Hobbitsies. This is, however, a microscopic portion of blogs I love! I think my post on ratings and how other bloggers do them, called "Ratings: What Works and Why" easily takes the cake in this case. Jordyn of Ten Cent Notes recently did a post called Please Be Nicer about depression and how reviewers react to characters who are suffering from it. However, I also always love discussion posts from April of Good Books and Good Wine, Jessica of Chick Lit Teens, and Adele of Persnickety Snark. This last bit should go without saying, but I also loved reading everyone's Speak Loudly posts. I think The Twin Cities Book Festival, because I got some awesome books, attended a few panels, and had lunch with some totally awesome bloggers! 6. Best moment of book blogging in 2010? Seeing our community come together as a whole when Wesley Scroggins tried to ban Speak by Laurie Halse Anderson. It was great to see everyone standing up for what they believe in and voicing their opinions. But I guess on a more personal note I've also enjoyed moments such as hitting 100 blog followers. I've discovered some awesome new bookstores this year! Thus far my favorites have been Red Balloon Bookshop and The Wild Rumpus. They both have great selection as well as awesome author events. Excellent answers! Surprisingly find a book that was most disappointing for me this year is the hardest thing for me. I know it exists but I just haven't thought of it yet. Aww, thanks so much for mentioning my post in there. :) Love your answers; I'll have to be on the lookout for Crossing Lines. Wow! This was such a great post. It shows you put a lot of thought into it. I have many of these books on my TBR pile, but I have to add a few more. Ooh, this a great survey! I mean, some of these I was planning on discussing anyway, and this has it all together and some I hadn't even thought about. I'm sad Entwined was a disappointment, it has such a fantastic cover! :( Definitely right on Shadow Hills, though. It was a letdown.